04/2019: Phalanx, Clarkson’s highest honorary society, has recognized Dr. Wriedt with two awards, the Commendable Service Award and the Commendable Leadership Award. See photo here. Wriedt lab undergraduate researcher Michael Chirgwin was also recognized by Phalanx with the Commendable Leadership Award. Congrats! 04/2019: Wriedt lab students win three awards at the Spring Research and Project Showcase (RAPS) at Clarkson University. Graduate student Juby Varghese won the Best Poster award, and Shefa Alomari won the Best Oral Presentation award and First Sustainability price. See photo of all presenters here. Well done! 03/2019: The collaborative Ignite work of Drs. Wriedt and Mitlin has been featured on The Research Connection. 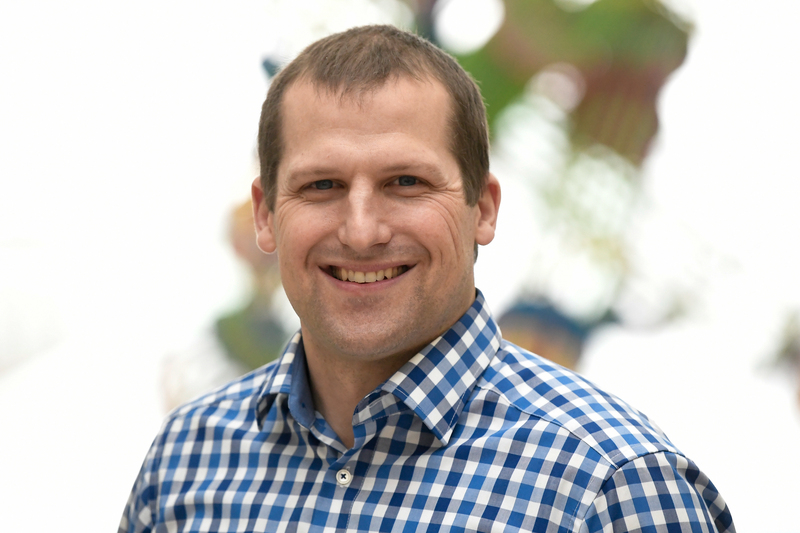 02/2019: Dr. Wriedt has been granted tenure and promotion to Associate Professor of Chemistry. See news release here. 02/2019: Wriedt lab welcomes new undergraduate researchers Gavin Flavell, Hope Woodruff, Sam Pyser and Stephanie Barajas. They will start their work in summer. 01/2019: Dr. Wriedt was featured as Spotlight in the 2018 Presidents Report. See page 4 here. 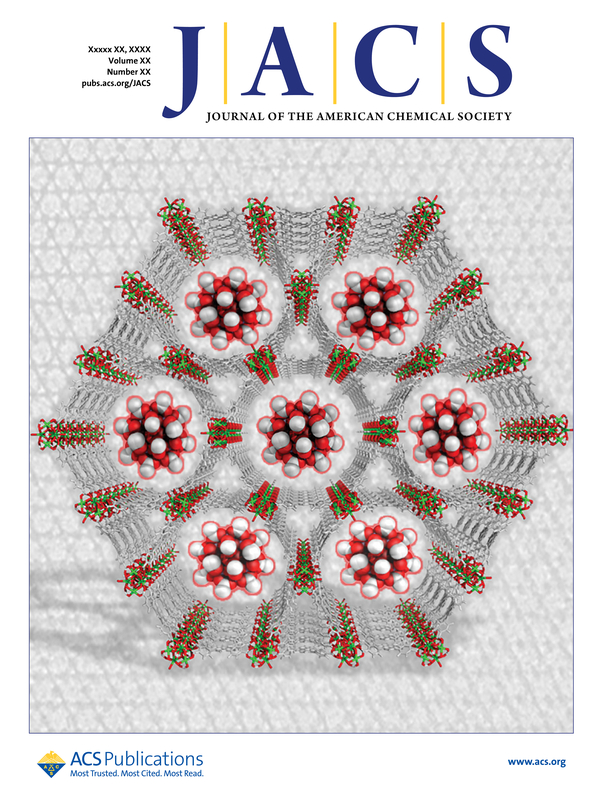 01/2019: Wriedt Lab’s work on “Direct Imaging of Isolated Single Molecule Magnets in Metal-Organic Frameworks” was featured on the cover of JACS. See news release here. 11/2018: Wriedt Lab’s paper in Chemistry of Materials was rated one of the top 20 most highly downloaded papers in November 2018. Congrats! 11/2018: Dr. Wriedt delivered an invited talk at the Chemistry Department, University of South Dakota. 10/2018: Wriedt Lab publishes paper on “Rational Design of Pore Size and Functionality in a Series of Isoreticular Zwitterionic Metal-Organic Frameworks” in Chemistry of Materials. See news release here. 08/2018: Wriedt Lab welcomes the new graduate students Monu Joy and Sudhan Nagarajan. 07/2018: Wriedt Lab graduate student Juby Vargehese won the Dr. Petr Zuman Award in Chemistry for her contributions to the electrochemistry field. Congrats Juby! 07/2018: Wriedt Lab undergraduates Jenna Brockett and Anthony Hopkins won the Best Poster Presentation Award in Sustainability at Clarkson’s Summer Research and Project Showcase. Well done! 07/2018: Wriedt Lab has big impact at the Annual Meeting of the American Crystallographic Association in Toronto, ON. Juby Varghese received the Margaret C. Etter Student Lecturer Award and Dr. Wriedt gave an invited talk and organized a session on MOFs. Both were featured in ACA RefleXions, see pages 26 and 34. 07/2018: Dr. Wriedt was invited to talk at the Crystal Engineering and Emerging Materials Workshop of Ontario and Quebec, McGill University. 06/2018: Wriedt Lab welcomes Honor and Prefrosh student Anthony Koppers as new undergraduate researcher this summer. 05/2018: Wriedt Lab graduate student members contributed three poster presentations at the Annual CAMP meeting in Canandaigua, NY. 04, 05/2018: Dr. Wriedt gave invited talks at Research Seminars of the University of Central Florida and University of South Florida. 04/2018: Dr. Wriedt delivered his tenure talk at Clarkson. 04/2018: Wriedt Lab members contributed with a total of 11 oral presentations and 4 poster presentations at Clarkson’s Research and Project Showcase (RAPS). Impressively, they won 7 out of 7 possible awards: Juby Varghese, best graduate oral and poster presentation, honorable mention for sustainability award; Fletcher Dix, best undergraduate oral and poster presentation, sustainability award; and Steven Dunckel, best undergraduate oral presentation. Well done and congrats! 04/2018: Former Wriedt Lab graduate student Dr. Darpandeep Aulakh was recognized with the Outstanding Graduate Student Award by the Department of Chemistry & Biomolecular Science AND Clarkson University. Following her postdoctoral assignment in Prof. Matzger’s group at the University of Michigan she accepted a position as Research Assistant Professor at the University of Toledo. Congrats Darpan! 03/2018: Dr. Wriedt delivered an invited talk at the Chemistry Department of SUNY Potsdam, NY. 03/2018: The team of Dr. Wriedt and Dr. Mitlin were awarded the prestigious Craig-Ignite Fellowship to fund a Ph.D. student for a 5-year period. 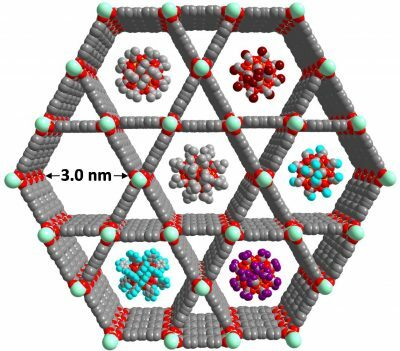 They collaboratively explore nanoporous carbons for carbon capture applications. See news release here. 01/2018: Dr. Wriedt hosted a group of high school students from the Senior High School Canton, NY. Students got hands-on experience with modern X-ray diffractometers. 01/2018: Wriedt Lab welcomes Jenna Brockett as new undergraduate researcher. 12/2017: The NSF DMR announced that Dr. Wriedt was recognized with the prestigious CAREER award for his work on the design of a new class of advanced porous materials for energy applications. See news release here. 12/2017: Wriedt Lab’s highlight article on “Porous substrates as platforms for the nanostructuring of molecular magnets” was featured on the cover of CrystEngComm. Congrats! 10/2017: Wriedt Lab welcomes Charlene VanLeuven as new undergraduate researcher. 10/2017: Dr. Wriedt gave a talk on the impact of his work to the Center for Lifelong Learning in the North Country. 09/2017: Wriedt Lab welcomes Matthew Sadler as new undergraduate researcher. 07/2017: Wriedt Lab students contributed two poster and three oral presentations at the Clarkson’s Summer Symposium on Undergraduate Research Experiences. Two awards were won: Co-presenter Alexander Harley and Rachel Meacham, best undergraduate oral presentation, and Michael Chirgwin, best undergraduate poster presentation. Well done! 06/2017: Wriedt Lab welcomes Honor and Prefrosh student Rachel Meacham as new undergraduate researcher this summer. 06/2017: Wriedt Lab’s paper in Dalton Transaction was featured on the Journal’s cover. Congrats! See news release here. 05/2017: Wriedt Lab welcomes Steven Dunckel ’20, CUPO student Paul Lawrence ’19 and Honor student Michael Chirgwin ’20 as new undergraduate researchers. Welcome and enjoy the summer! 05/2017: Wriedt Lab graduate student Juby Varghese spends the summer in Germany at the University of Applied Sciences, Lübeck, working on a collaborative project with Prof. Wochnowski. Have fun! 05/2017: Wriedt Lab undergraduate researchers Katrina Lane, Justin Cruz and Brenna Gillaspy graduated with Bachelor of Science degrees. Congrats and Farewell! 05/2017: Wriedt Lab’s paper entitled “Systematic Investigation of Controlled Nanostructuring of Mn12 Single-Molecule Magnets Templated by Metal-Organic Frameworks” was accepted for publication in Inorganic Chemistry. Well done Darpan Aulakh together with undergraduate Alexander Harley! 05/2017: Wriedt Lab’s first graduate student Darpan Aulakh successfully defended her dissertation. Congrats Dr. Darpan! 05/2017: Wriedt Lab graduate students Shefa Alomari, Hubert Bilan and Darpan Aulakh presented their work at the 30th Annual Technical Meeting of the Center for Advanced Materials Processing (CAMP) in Canandaigua, NY. 04/2017: Wriedt Lab students won 3 awards at the Northern New York ACS Meeting at St. Lawrence University. #1: Fletcher Dix, best undergrad oral presentation; #2: Kyle Duell, 2nd best undergrad poster presentation; #3: Juby Vargehese: best graduate poster presentation. Congrats all! Research and Project Showcase (RAPS) at Clarkson. #1: Katrina Lane, best oral undergrad presentation; #2 and #3: Kyle Duell, best undergrad poster presentation and undergrad sustainability award; #4: Alexander Harley, honorable mention for his undergrad poster presentation; #5 and #6: Juby Varghese, best graduate oral and poster presentation; #7: Hubert Bilan, graduate sustainability award. Congrats all! 03/2017: Graduate Student Darpan Aulakh was selected for a Travel Award from the Division of Inorganic Chemistry (DIC) of the American Chemical Society to support her attendance at the Spring 2017 ACS Meeting in San Francisco. Congrats! 03/2017: Wriedt Lab’s paper entitled “Design, structural diversity and properties of novel zwitterionic metal-organic frameworks” was accepted for publication in Dalton Transactions. Well done Darpan Aulakh together with undergraduates Anthony Nicoletta, Joshua Pyser and Juby Varghese! 01/2017: Graduate Student Wen An successfully defended her M.S. Thesis. Congrats! She continues her graduate studies as computer science major at Clarkson. 01/2017: Sam Marble, Chemical Engineering Major, Class of 2017, joined the Wriedt Lab as Undergraduate Researcher. Welcome Sam! 01/2017: Shefa Alomari, former Wriedt Lab Research Trainee since 06/2016, was accepted into Clarkson’s Ph.D. program. Welcome Graduate Student Shefa! 11/2016: Wriedt Lab’s paper was accepted for publication the Journal of Chemical Education. Dr. Wriedt and Darpan Aulakh implemented this lab module with great success in CM345. 10/2016: Wriedt Lab’s paper was accepted for publication in Chemical of Materials. Well done Wen An and Darpan Aulakh! See news release here. 08/2016: Brenna Gillaspy, Chemistry Major, Class of 2017, joined the Wriedt Lab as Undergraduate Researcher. Welcome Brenna! 07/2016: Graduate Student Darpan Aulakh received a Travel Award to attend the Annual Meeting of the American Crystallographic Association, Denver, CO. Her presentation was recognized with the Pauling Poster Prize and Graduate Student Juby Varghese was recognized with the Journal of Chemical Crystallography Poster Prize. Congrats! See news release here. 06/2016: Dr. Wriedt was invited to present at the Gordon Research Conference focusing on Crystal Engineering in Stowe, VT. See news release here. 06/2016: Graduate Student Darpan Aulakh was recognized as 2nd Best Oral Presenter at the ECS Montreal Student Symposium, Montreal, Canada. Congrats! 05/2016: Undergraduate Researchers Kyle Ventura and Joshua Pyser graduated. Both are currently attending top graduate schools, U. of Florida and U. of Michigan. You are missed and good luck for your futures! 05/2016: Graduate Student Wen An was recognized with the Best Looking Poster Award at the Annual CAMP Meeting, Canandaigua, NY. Congrats! 05/2016: Undergraduate Researcher Joshua Pyser was recognized with the Frank C. Goodrich Memorial Fund Undergraduate Award as an Outstanding Senior in Chemistry. Congrats! 04/2016: Undergraduate Researchers Joshua Pyser, Katrina Lane and Alexander Harley were recognized as Best Poster Presenters at Clarkson’s Symposium on Undergraduate Research Experiences (SURE). Congrats! 03/2016: Xulan Deng, former Wriedt Lab undergraduate researcher, was awarded a prestigious Goldwater Scholarship. Congrats! See news release here. 03/2016: Graduate Student Darpan Aulakh was recognized as Best Poster Presenter at the NNY ACS Research Symposium, Potsdam, NY. Congrats! 02/2016: Graduate Students Darpan Aulakh and Juby Varghese were recognized as 2nd Best Poster Presenters at the Bruker-AXS MIT Symposium, Cambridge, MA. Congrats! 02/2016: Wriedt Lab’s paper was accepted for publication in CrystEngComm. Well done Darpan Aulakh together with undergraduates Anthony Nicoletta and Juby Varghese! Welcome to the Functional Materials Design & X-ray Diffraction Laboratory at the Department of Chemistry & Biomolecular Science at Clarkson University! Dr. Wriedt’s research activities are mainly focused at developing new strategies for the design and synthesis of advanced functional solid-state materials from molecular building blocks and advancing the understanding of their structure-property relationship. His group at Clarkson University works towards the development and characterization of new metal-organic frameworks (MOFs) and activated carbons whose applications address some of our society’s most challenging needs. Specific fields of interest are listed below. 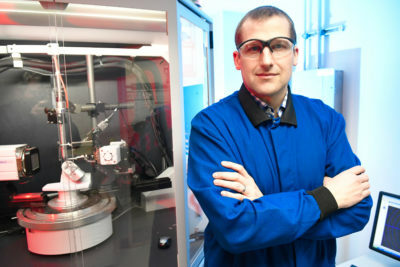 April 2019: Dr. Wriedt has been awarded a grant funded by Corning Incorporated for his research into electrically activated molecular assemblies. These original chemicals can be used to make smart windows. Smart windows, which are already used on some aircraft and commercial buildings, are windows whose transmission properties change when voltage, light, or heat is applied. Wriedt’s group at Clarkson specializes in the rational design and synthesis of molecular assemblies, including advanced crystalline porous materials that form multi-dimensional networks suitable for a wide variety of applications. While such materials are typically regarded as insulators, through fine-tuning and modifications, Wriedt and his team have found a way to induce conductivity and make their materials electrochemically-active. This grant from Corning Incorporated will enable new and exciting ventures for Wriedt and his team of 15 student researchers including graduate and undergraduate students. We are excited to announce that we will host a workshop on Problems, Errors and Pitfalls in Single-Crystal Structure Analysis at Clarkson University on August 5-8, 2019. Dr. Wriedt and Dr. Näther of Kiel University are the instructors. See further details about this workshop and how to apply here. February 2019: Clarkson University President Tony Collins has announced that Mario Wriedt has been granted tenure and promoted from assistant professor to associate professor of chemistry & biomolecular science in the School of Arts & Sciences. This is the result of a fantastic collaboration with groups of Professors Yu Han at KAUST, Omar Farha at NU, and Kim Dunbar at TAMU. DOI: 10.1021/jacs.8b11374; see news release here. DOI: 10.1021/acs.chemmater.8b03885; see news release here. December 2017: Thanks to the National Science Foundation Early CAREER Program. Dr. Wriedt was recognized with this prestigious award for his work on the design of a new class of advanced porous materials for energy applications. March 2018: Dr. Wriedt, partnered with Dr. Mitlin from Chemical Engineering, was awarded the Craig-Ignite Research Fellowship of Clarkson’s Pilot Grant Program to support a Ph.D. student for five years to conduct a multidisciplinary research project. See news release here and a short video of the program here. A recording of the live competition can be found here (Dr. Wriedt’s pitch starts at 1:54). See video description of the funded project here with the job posting for the fellowship here. Update summer 2018: This position has been filled. April 2018: Wriedt Lab members contributed with a total of 11 oral presentations and 4 poster presentations at Clarkson’s Research and Project Showcase (RAPS). Impressively, they won 7 out of 7 possible awards, congrats! RAPS attendees of Wriedt Lab (Jenna Brockett, Matthew Sadler, Paul Lawrence, Shefa Alomari, Hubert Bilan, Steven Dunckel, Michael Chirgwin, Charlene VanLeuven, Fletcher Dix, Juby Varghese, Alexander Harley, John Hadynski, and Mario Wriedt) RAPS awardees Juby Varghese (Graduate, best oral and poster presentation, honorable mention for sustainability award), Fletcher Dix (Undergraduate, best oral and poster presentation, sustainability award), and Steven Dunckel (Undergraduate, best oral presentation). DOI: 10.1039/C7DT00292K; see news release here. DOI: 10.1021/acs.chemmater.6b03224; see news release here. DOI: 10.1021/jacs.5b06002; see news release here. by Omar M. Yaghi (Associate Editor), J. Am. Chem. Soc., 2016, 138, 15507-15509. Doctoral New Investigator Award (ACS PRF DNI). Award# 56295-DNI10; 2016-2018; $110,000 .